Rolling Stones, Joni Mitchell, Cream and Pete Seeger. Sarah Gray and John Sanford speak to Chris Bird from Transition Homes. 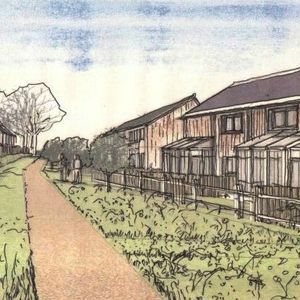 Transition Homes Community Land Trust has submitted a planning application for a development of 27 affordable, eco-homes on a site near Dartington village. This project is being designed along permaculture principles of Earth Care, People Care and Fair Share. Plans include integrated food growing, water ecological treatment (WET) systems, coppice for biomass fuels, forest garden, renewable energy systems, wildlife areas and a community hub that will also serve as an education and training centre. This show was originally broadcast live on Tuesday 26th January 2016 on Soundart Radio.